A 25-year-old social studies teacher in Florida has been secretly hosting a white nationalist podcast and bragging about espousing her views to students in the classroom, an exclusive report by Huffington Post has revealed. Dayanna Volitich, an educator at Crystal River Middle School, was the voice behind white nationalist podcast “Unapologetic,” where she comfortably spewed her racist views under the pseudonym “Tiana Dalichov.” Since news of Volitich’s secret podcast came to light, the Citrus County School District announced she’s been removed from the classroom pending an investigation. In her most recent podcast on Feb. 26, Volitich sided with a caller who spoke out against diversity in schools and challenged the idea that “a kid from Nigeria and a kid who came from Sweden are supposed to learn exactly the same” and are equally intelligent. Volitich went on to brag about teaching her ideology in the classroom and lying to administrators about it. Volitich said the Crystal Rivers principal confronted her about the parent’s complaint, to which she lied and said it wasn’t true. “She believed me and backed off,” she said. 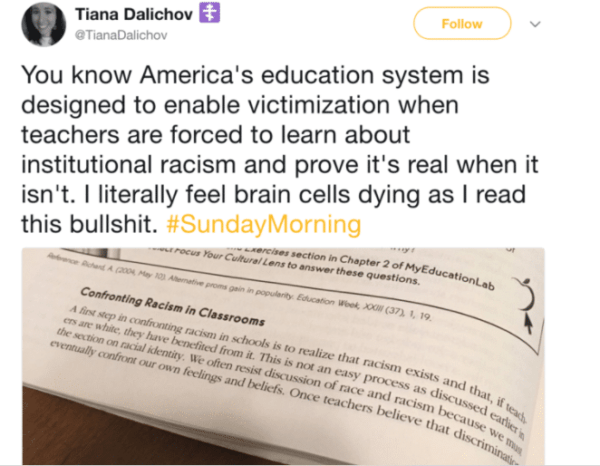 In the same episode, Volitich agreed with her guest’s argument that more white nationalists should infiltrate the school system by becoming teachers, according to Huff Post. The report was able to link Volitich to Dalichov using public records shared on social media and comparing it to personal information like her age, hometown and work history. “Tiana Dalichov’s” Twitter account conveniently went dark the news broke. She also removed the website for her podcast. Meanwhile, several commenters are calling for she to be fired. We will continue to update this story as more details become available. Previous Previous post: Taxpayers—Not Big Pharma—Have Funded the Research Behind Every New Drug Since 2010 A sweeping new study challenges our understanding of medical breakthroughs.